Theatrefront’s production of “Our Country’s Good”, now playing at the Tarragon Theatre Extra Space, is a cause for celebration. Up-and-coming director Daryl Cloran has assembled a young cast bursting with talent the likes of which I have not seen since the heyday of Robin Phillips’ Young Company at Stratford. With that talent applied to Timberlake Wertenbaker’s 1988 Olivier Award-winning play, one of the few to deserve the appellation “modern classic”, you have an evening of theatre that should not be missed. “Our Country’s Good” was first seen in Toronto in 1989 in the original production by Britain’s Royal Court Theatre directed by Max Stafford-Clark. It was the highlight of the theatre season that year, but I was afraid I’d never get the chance to see Wertenbaker’s wonderful play again. 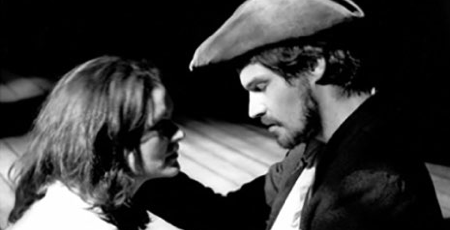 The play is based in part on Thomas Keneally’s 1987 historical novel “The Playmaker” concerning the story behind the first-ever performance of a play in the penal colony of Australia when in 1789 a group of enlightened British officers allowed a cast of convicts to present George Farquhar’s Restoration comedy “The Recruiting Officer”. The goal of this social experiment, conceived of by Lt. Ralph Clark and sanctioned by the presiding governor of New South Wales but bitterly opposed by many, is to open the eyes of the convicts to a more refined way of life and self-expression through their acting of Farquhar’s idealized characters and their elegant mode of speech. The very structure Wertenbaker gives play reinforces its theme about the transformation in that ten of the eleven actors play at least two very distinct roles. Wertenbaker does this to show that imagination is the primary weapon against type-casting. Thus, Xuan Fraser, who plays both an Australian aborigine and a ex-slave from Madagascar, also is cast as Arthur Phillip, the enlightened English governor of New South Wales. Similarly, three of the four women playing prisoners are also cast in one scene as male officers. Indeed, the Farquhar play they are rehearsing involves a woman who disguises herself as a man to be near the man she loves. When the subject is broached in the play whether the audience will find this doubling (in Farquhar) confusing, Clark answers that the audience will not as long as they pay attention and “People who cannot pay attention should not go to the theatre”. Hear, hear! Fortunately, the cast does a superb job of keeping their double (or triple) roles clear and distinct. While this is an ensemble work, there are a number of notably fine performances. Damien Atkins gives Captain Watkin Tench, who mocks the notion that criminals can be reformed, a haughty air and upper class accent in complete contrast to his other role as Ketch Freeman, the meek Irish hangman despised by all the prisoners. Shane Carty uses a complete change of voice and demeanour to distinguish the sober, enlightened judge David Collins from the comically flamboyant pickpocket and would-be actor, Robert Sideway. Andrew Pifko also uses change of accent and demeanour to separate his role as the brutal Scot, Major Robbie Ross, who regards the prisoners as little more than animals, from the prisoner John Arscott, who sees acting as a means, if only temporary to forget the squalor of the prisoners’ conditions. The roles for the rest of the cast are not so evenly divided. While Michel Protti has a scene as the prudish Reverend Johnson, his major part is a very affecting portrait of the Jewish convict, John Wisehammer, whose love of words seems to sustain him in this harsh environment. Similarly, while Danielle Wilson has an hilarious scene as a lubricious hag, her primary role is a deeply-felt portrayal of the prisoner Duckling Smith, in love with a midshipman but oppressed by his jealousy. While Aaron Franks has a role as a nearly inarticulate officer, his main part is as Duckling’s lover, Harry Brewer, a former hangman haunted by the ghosts of his victims. His scenes with Duckling are very effective, but in the scenes of possession quiet intensity would have served better than vehemence. Each of the remaining three women, though they also play male officers, have a single primary role. Araxi Arslanian, full of life and longing for her native Devon, is a delight throughout. Her role has a number of similarities with Bottom in “A Midsummer Night’s Dream” and it would be a treat if some creative director would so cast her. Molly Jane Atkinson plays Mary Brenham, who gradually overcomes her shyness in rehearsing the role of Farquhar’s resourceful Silvia. While her accent may be a bit too upper crust for her part, her performance is otherwise very affecting. Patricia Fagan plays the crucial role of Liz Morden, a hardened woman hated by the officers and prisoners alike, but the sullenness Fagan conjures up is not really a sufficient substitute for suppressed rage and disgust one would expect. The only actor assigned only one role is Craig Erikson, excellent as Lt. Ralph Clark, who formulates the idea of presenting a play, becomes its director and eventually must act in it as Silvia’s beloved Captain Plume. Art proves a path to reality as his rehearsals with Mary Brenham help him to overcome his ludicrously sentimental worship of the girl he left in England for the physical reality of the woman before him. In a play about the power of imagination to transform reality, Karla Faulconbridge has providing a simple but very clever set, sensitively lit by Wendy Greenwood. Its two tiers of planks and two angled masts can, with additions of canvas rigging, transform instantly from a ship to barracks to the outdoors to back curtain in the final scene. Daryl Cloran has directed this complex, engaging play with great fluidity, clarity and assurance. His decision to have costume changes occur in full view of the audience and set changes in half-light rather than blackouts reinforces the play’s structure as theatre about theatre. If there is a weakness in his direction, it is in not generating sufficient tension, particularly in a number of key scenes. In the original production, Captain Ross’s humiliation of the actors was far more brutal and disturbing; Ralph Clark’s acceptance of the reality of his love for Mary seemed harder won; and Liz Morden’s abandonment of her code of silence had a far greater sense of release. Yet, Cloran’s command of the whole and his insight into how the numerous short scenes are meant to play off each other is very impressive. Such a fine production of such a wonderful play deserves the widest possible audience. Photo: Danielle Wilson and Aaron Franks. ©2001 Christopher Sealy.